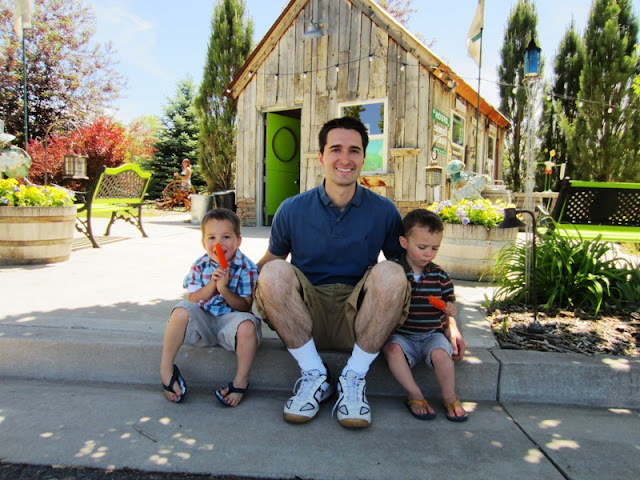 I'm working on a great post about visiting Logan and Cache Valley with young kids, but it's not ready yet so here is info about Willows Golf Park miniature golf course, one of the many kid-friendly places in Cache Valley. My family and I played a round there last Monday. FYI: Cash or check only. Credit/debit cards not accepted. The course can accommodate strollers as but might present some difficulty for wheelchairs. The Willows Golf Park is an 18-hole miniature golf course in Providence, Utah, a community which adjoins Logan to the south. The Willows is one of three miniature golf places I can think of in Logan. They all have their virtues, and some of Willows' are its friendly employees, well-kept and shady course, and relaxing atmosphere. Prices can add up for a large family, but 2 for 1 coupons for return visits ease some of the sting. The place can be crowded on weekend nights, but the course design and mature landscaping afford some privacy from the other groups on the course. Late hours (open until midnight Fridays and Saturdays) make it popular with college students from Utah State University, but it's also a great family destination, especially during the day when it is much less crowded. When we arrived at Willows Golf Park on a Monday afternoon there were only a couple of other cars in the parking lot. We proceeded through some nice sitting areas featuring chimineas and brightly-painted benches and were greeted at the cabin-like pay shack by a friendly woman. She took our cash payment, assisted us in choosing the right size of clubs for our small children, gave us our score cards, and advised us that one of the holes was having new turf installed, so we would have to skip that one. She told us we could play the course twice, then looked at our children (ages 2 and 4) and added, "If you can handle it!" We definitely couldn't have handled it, but it was a nice offer! Players proceed through 18 holes in a well-landscaped course that affords quite a bit of privacy from players ahead and behind one's own group. The course does not have novelty holes like miniature windmills and dragons who eat golf balls. Instead it features more standard golf course features like water hazards, "sand" traps, and gently sloping greens. Most holes are par 3. I may or may not have scored 8 on one of those. The day we visited the fountains and "streams" were turned off, with the water in the large pond standing stagnant. In our case this was a good thing, because our toddler quickly lost interest in putting and took up playing in the water. More of it would have meant more trouble! Perhaps the water was off due to the workers applying new carpet in the park. No outing with kids is complete without a visit to the restrooms. Willows Golf Park's restrooms, housed in another rustic cabin-like building, are clean and well-functioning. When we finished our round and returned our clubs, the woman at the desk gave our kids popsicles and handed us a card good for 2 for 1 golf on a return visit. This has been my experience on previous visits as well. Willows Golf Park is a great outing for families, groups of friends, awkward first dates, and good dates too! P.S. : How competitive do you feel when you go MINIATURE golfing? I'll admit I want to win. Tyson beat me by 8 shots in this game after I got off to a rough start. Anyone have any great miniature golfing stories? Logan briefly had a glow-in-the-dark indoor miniature golf course that brought a whole new level of awkwardness to a miniature golf first date. This comment is a few months too late, but you have to do the golf course around Halloween. They decorate the entire course and certain nights are "haunted." We go every Halloween at least once!